Parima talu auhinna võitnud Elen ja Urmas Tekkel koos lastega: (vasakult) Martin, Grete ja Mattias. 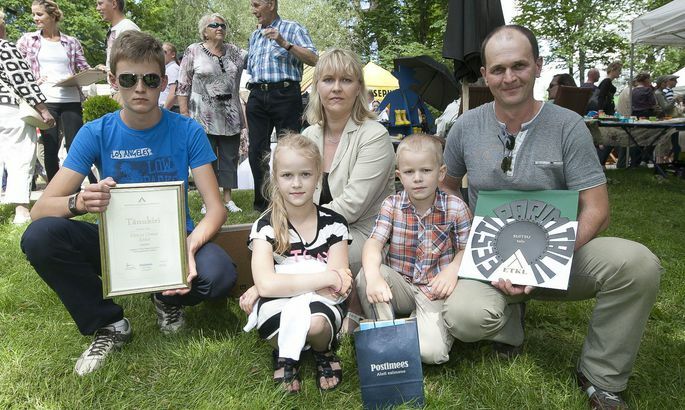 At the Estonian Farm Days in Jädeda this past week-end, 19 years old Suitsu cereals farm at Pikasilla, Valga County was proclaimed Farm of the Year 2015. The man of the house Urmas Tekkel said they had been begged to participate before, but thus far he never figured the buildings were fit enough. Aasta talu tiitli pälvis Suitsu talu Valgamaalt. «But we never undertook to dig and plant just for the competition – what we had to show was the daily maintenance, around the house and on the fields,» said Mr Tekkel, growing grain on over 200 hectares of land. The place featured farming throughout the Soviet period. «The people did go to work elsewhere, but it was in the blood... the need to get the hands dirty,» he explained. Mr Tekkel inherited the lands from parents. The first time he sowed seeds was in 1996, on seven hectares. «Back then, just the fact of sowing something was quite a feat,» he recalls, explaining that the crops were nothing like today. This year looks promising quantity wise, but they doubt about the quality – they’d not want any more rain, and towards the end of the summer the grain could use more warmth. As for the harvest, usually at the initial week of August, this year it may be late in coming. Urmas and Elen Tekkel raise three kids, the oldest of whom is Martin (15). This fall, he is launching into studies at Olustvere Rural Economics School to follow in footsteps of father. Grete (8) and Mattias aged 5 are helping as they are able. Farmers Union chairman Kaul Nurme said that over the 23 years the competition has been held, fields have kept increasing in beauty. «At least that’s the emotional feeling,» he said, adding that the new feature is added variety. «If one dwells in the countryside and has not hundreds of hectares of fields and hundreds of cows in the shed, one must think about his niche on the market – where’s an opening, what am I able to do,» said Mr Nurme. To illustrate, he pointed to the milk farms who grow grain as well. These make ends meet even when milk production is at low ebb. «Specialising too narrow may hurt,» noted Mr Nurme. All in all, 14 farms competed and the prizes were various. Among alternative activity farms, 1st place went to Seedri holiday farm in Rõuge Parish, Võru County arranging weddings, managed by Margit and Oleg Udodov. The best young farmer is Torben Skov with young wife Katrin Kohk. The man moved here from Denmark ten years ago, and bought himself a farm. The couple are managing 550 hectares of land and tending 60 beef animals. The family has a son aged a year and a half called Johan.